Opening phrases are on/off switches. How much do you read before you decide to carry on or turn the page? How do writers create opening phrases that will hold your attention? I have done some research (picked up papers and magazines lying around my house and checked my favourite blogs). They are articles published in magazines or blogs rather than books. So they are competing for your attention with other articles. They were written by people who take writing seriously (rather than people who write emails simply to get the job done) so I consider it fair to comment on their choice of words. So are some more successful than others? In my opinion, yes, but that is just the point. If I am the reader they were trying to attract and I stop reading after the first line, they have failed. But if what if I would never have been interested in the subject matter however well it was written? I think numbers 1 and 3 take too long to tell me what is going on. My advice is never to start with statements about dates and times such as ‘The company was founded in 1924’ because nobody cares. Or is it just me that doesn’t care? Number 2 bores me because I am not interested in regimental history but if I were it would catch my attention immediately. Number 4 sounds lively and packs a lot into the first few words, so if I care about the history of flying I will read on. I might even read on to see if I could learn something new because I like the writer’s accessible style. Number 5 is intriguing – a remarkable story summarised in a few words. Number 6 is drawing us into a personal story. We do not know the individual but we are being asked to imagine being in her place. In the first few words we know she is female and a strong character (village leader) and we are beginning to suspect that something awful has happened. I certainly read on. Number 7 is news about a well known story of great interest to some. We know what it is about up front and that is all we need. We know that number 8 is going to be written in a jaunty, informal way and that it is about languages. I read on for both reasons – but I guess just as many people would be put straight off. Is that a problem? Number 9 uses a common technique (in this paper anyway) of referring to an unnamed pub, MP, street or village and then in the next paragraph to tell you which one it is all about. I guess the purpose is that you read on thinking ‘Oh no! surely not MY pub, MP etc’ for a bit longer than if they had told you up front. I’m not convinced. Number 10 is openly whacky and I love it. I like most of the writing on that blog and would recommend it to anyone with an interest in writing techniques. Many people would no doubt dismiss it as pointless and silly. Number 11 is about silent letters in English – a pretty specialist area with little general appeal but surely you cannot fail to be impressed by the use of the word ‘tiptoeing’? I will read anything that promises inventive writing like that. Number 12 tells us that it will provide tips about speaking beyond choice of content. In the magazine of an international speakers’ club, that is no great surprise, but it does an unremarkable job adequately. What do you think? What opening phrases work for you? How do you choose them when you write? Like him or not, Boris Johnson is a lively writer. He often tells a story to draw his readers into his topic – and I find it a nearly irresistible technique. Tell me honestly, when you get to the end of the first paragraph below, don’t you need to know the source of Boris’s childhood shame? I certainly would not have put the paper down at that point. “Lurking in the childhood of anyone ambitious there is always the memory of some humiliation that sets them on the path of self-improvement. Show me a billionaire, and I will show you someone who was beaten up for his lunch money. Many is the megalomaniac who first had to overcome a case of acne or puppy fat or being forced by his mother to wear a flowery tie to a friend’s birthday party. You want to know my moment of childhood shame? Shall I tell you when I decided that I was going to have to sharpen up my act to survive? The picture of the young Boris sitting on a sunny river bank is easy to imagine, and many readers will identify with his shame. But the point of the story was to get you into his argument about methods of teaching reading. For that you will need to go to the Telegraph for the original article. I accept that most business writers do not have the luxury of time or space to tell stories like this in proposals and reports. But what about a few lines of illustration, a sentence with a vivid example or a verbal snapshot of life after the investment you are arguing for? Instead of ‘the new software will enable automatic transfer of data and remove inputting errors’, could you say ‘after installation, there will no longer be a risk of Mrs Dorman becoming a doormat or of a bill for £100 being sent out as £10,000’? Even board members are human and if your proposal brings the issue to life with examples they can relate to, I bet they are more likely to approve it. The audience at the Barbican almost certainly included expatriot Malians, fans of the music who have never been to Africa and everyone else between. 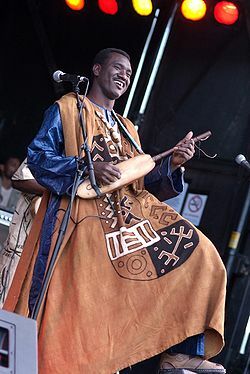 So the programme notes needed to deal with Mali and its current crisis in in a way that would come alive for those without personal experience of the country and help them to connect with the musicians. I think they succeeded. Andy has introduced the characteristics of the desert as part of an observation that nostalgia is what we feel for the familiar; it doesn’t have to be logical or seem appealing to anyone else. He sneaks his description in without saying in so many words “This is what the Sahara is like”. The result, in my opinion, is that he paints a captivating word picture without being condescending to readers who already know all this. I often encounter the need for this technique in business writing classes. It is not straightforward to write for audiences with different levels of background knowledge without being boring, but this is certainly one way of doing it. How do we get from OK to WOW! Writing well – what is it? I try to help people to do it but the longer I work and read the more I realise how subjective this notion is. I can recognise many types of bad writing. It may be difficult to read because the sentences are too long, or because it includes specialist words that are not clear to the intended audience or because rambling diversions get in the way of the point. Poor spelling and grammar can make reading hard work too of course but I am totally bored of blogs and LinkedIn threads that point this out. What makes a piece of writing exceptionally good? I hope that my writing is usually readable and unlikely to be selected as an example of how not to do it. But that is hardly a boast from someone who makes a living by helping people to write well. The writing I enjoy reading and the prose you pick out as exceptional will be different. Of course. We choose different clothes, partners, pets and neighbourhoods and we have been exposed to different influences. Exploring this question will amuse me and may help me to do my job better. I hope that it will also provide some interesting thoughts for you, my readers. I always tell my classes that the first thing they must do is to analyse their readership. So who are you? You take an interest in writing and the English language. You are probably quite highly educated and you have the time and inclination to graze in the blogging fields. Some of you I know personally as consultants or retired teachers – that seems to fit. With you over the next weeks, I am going to attempt to expand my understanding of what makes writing good rather than what stops it from being bad. To misquote Lennon and McCartney, let’s take a good song and make it better. Let’s think about what makes us notice a piece of writing for positive reasons, and read it again, and forward it to our friends. 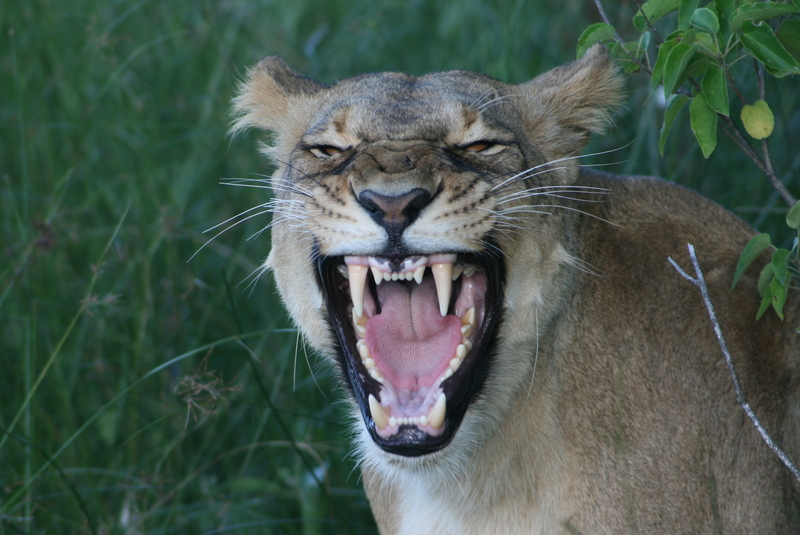 The lioness above is more likely to extract a wow! from you than this piece of writing. She was the result of preparation, the patience, skill and experience of others, being ready at the right moment and a large dose of luck. There are some transferable lessons in there for sure. Proper English – is there such a thing? This excellent question is posed in an interesting way by Kieran Ball who is currently studying English at university. Kieran and I will both be very interested in your comments. Is there? Parents are always correcting their children when they have made a mistake in their use of language or grammar, but what are they comparing it to? Looking across Britain it is clear that there are hundreds if not thousands of different forms of English – regional, cultural, occupational – none of which would be deemed as Proper English in that parent’s book. Or would it? For example if the parent and child lived in the city of Liverpool, the regional dialect and accent of Scouse would be extremely prominent so surely this must have an influence on the parent’s concept of Proper English. The child in this case would be taught “Proper English” from a young age that must have Scouse influences in it. Even when the child reaches school age and continues to be taught English in school, Scouse would continue to have its influence. And it’s not just Liverpool. It could be anywhere – Newcastle, London, Birmingham – all of these places will have aspects of the prominent accents and dialects which would take a place in somebody’s understanding of what proper English is. And again it’s not just related to geography. It would depend on hundreds of different influences – parents’ upbringing and education, the child’s friendship group, the child’s education and so on and so on. So is there really a “Proper English”? How can there be? There are too many different influences to prevent there from being a set one. Each individual’s perception of “Proper English” will be different from everybody else’s. Of course it’s an old chestnut, but it’s also extremely important and becoming more so. If you are speaking or writing to people from a different culture, (aren’t we all, most of the time now?) you have to choose your words carefully. Imagine you had to look your own words up in the dictionary. Would you be able to find them? How would you distinguish between ‘I can’t put him up’ and I can’t put up with him’? Anyone who has done business abroad must have their own examples of putting their foot it in (there I go). A carefully designed pension scheme almost caused the collapse of a nearly complete company purchase in Los Angeles until the name was changed to ‘pension plan’. Apparently the word ‘scheme’ is always negative in the US – and would sound to Americans as the word ‘scam’ sounds in the UK. Now imagine someone standing up and introducing the ‘pension scam’. How would you react? 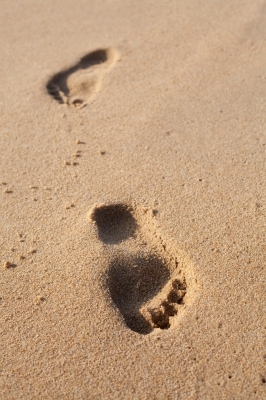 One of the slides in a presentation I use bears the words ‘put yourself in their shoes’. I have learned not to use it in the Middle East. Choose your words carefully in cross-culture communication. My conclusion is that the only way to communicate with people from other cultures (and that includes Yorkshire if you are a Londoner) is to keep it straight and literal – or check understanding as you go along. Boring maybe, and quite difficult, because we use metaphorical language so automatically, but safe. I have just returned from Brussels, where I have not been since I visited my uncle there as a teenager. I knew Belgium was a bi-lingual country of course, but I have just witnessed the real impact of this on the professionals who work there. I was delivering a series of short workshops on professional writing at the Brussels office of a UK law firm. As soon as the delegates started arriving, I heard three languages effortlessly mingled. Everyone seemed to me to be able to speak perfect French and Flemish and used them alternately depending on who they were talking to. When they addressed me they slipped into English which was in most cases almost as perfect. Now think about their working lives. Lawyers here in the UK have a lot to deal with – but they only have to do it in one language! A first language Flemish lawyer in Brussels has to talk and write about legal issues in both French and English. They have to remember which is which of the ‘false friends’ such as eventual and eventuel; actuel and actual; and sensible and sensitive. That’s hard enough when you are just dealing with your first and second language let alone your second and third. Oh and by the way I discovered a new ‘false friend’. The word ‘acteur’ is used in business French to mean ‘representative’ or ‘stakeholder’. I guess we would sometimes use ‘player’ which would be a close equivalent but the direct translation to ‘actor’ simply does not work. In the Brussels law firm, multiple languages are not worthy of comment, they are just part of life. Before you can start work, you have to speak three languages more fluently than most first language English people can speak two. And just think for a moment about the problems of having to translate practically every document before it can become legally binding. I was lost in admiration. But as a linguist, I was also envious. In my daily life, I almost never have the opportunity to read or hear French or Spanish. Television here is all English, in Brussels there are French, Flemish and English channels at the touch of a remote button. I happily watched a stupid game show just to listen to the fast colloquial French. Where in England can I do that? This is not an entirely rhetorical question. Do you happen to know of an internet radio station that you would recommend for learning South American Spanish? If so, please let me know. 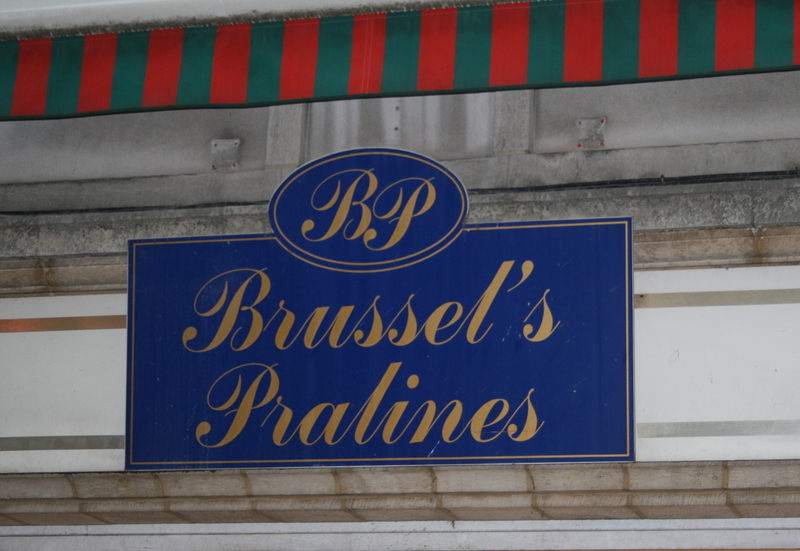 PS As you see in the picture praline makers, like grocers, get confused by apostrophes. What language is this sign in as a matter of interest?